Demand conditions in the auto sector are expected to remain strong with double-digit growth. Strong rural demand and aggressive funding have propelled a broad-based upcycle although there are some concerns on axel-load norms for commercial vehicles (CVs). Mahindra and Mahindra (M&M) expects 10-15 per cent growth in FY19 across sectors – utility vehicles, tractors and CVs. Hero MotoCorp is gaining from rural revival and new products. Ashok Leyland has increased volume growth guidance of 15 per cet for FY19, unfazed by the impact of changes in axle load norms. However, we remain cautious on CVs. Motherson Sumi has maintained its guidance of attaining US$18bn FY20 sales on the back of robust organic growth, aided by domestic growth and healthy pipeline of potential acquisitions. CEAT is banking on expansion-led growth. Rising cost pressure is also evident but several players have initiated price hikes. M&M and Escorts are bucking the trend with adequate price actions and operational efficiencies. Competition remains high in 2W, resulting in only a partial pass-through of costs. Ashok Leyland is facing margin pressure. Domestic medium and heavy commercial vehicles (M&HCVs) industry to grow at 15 per cent in FY19: Post 65 per cent yoy growth in volume in April-July, 2018, the company expects 15 per cent growth in FY19, which implies a growth of 2 per cent in the remaining months. Despite change in truck axle load norms, the company expects positive growth in the remaining months, supported by strong infrastructure demand and general improvement in macroeconomic environment. *New products: The company is planning to launch a slew of new products in domestic as well as overseas markets in FY19. Domestic light commercial vehicle (LCV) volume to grow in double-digits, led by strong demand and new product launches. *Export volume to grow by ~20 per cent in FY19, led by strong demand in African/Asian markets. *Scrappage Policy: the government may implement scrappage policy for over 20 years old vehicles from April 2020. The company estimates potential scrappage volume at 200,000-250,000 vehicles. *The domestic tractor industry is set to grow at 12-15 per cent in FY19, and the company expects to outpace industry growth. Volume growth to be supported by normal monsoon and government interventions (subsidy for Farm Equipment expected from Gujarat, Andhra Pradesh, Telangana, Haryana, Himachal Pradesh etc). The Assam government has launched a subsidy scheme for 24,000 tractors. Management expects to garner 20 per cent share in this scheme and execution may happen over 1-2 years. *Strong outlook for construction equipment industry: Expects 16-18 per cent construction equipment industry growth for FY19. Post strong growth in Q1FY19, growth could taper off in the subsequent quarters due to elections. *Tractor exports to grow by 50 per cent in FY19, led by the launch of new products and increased penetration across geographies. The company has presence in markets such as US, Latin America, Africa, Europe and SAARC regions. *The current dealership network stands at 870 and the company expects to add 150 dealers in FY19 and reach 1,000 dealers by FY22. *Capex of Rs 300 crore planned in FY19, which includes Rs 100 crore for addition of machining capacity, Rs 200 crore for meeting new emission norms and product development costs. *Domestic volume to grow in double-digits in FY19: Double-digit volume growth is expected in the upcoming festive season and FY19, supported by strong rural demand and new products (two scooters and one premium motorcycle to be launched before the festive season). *Strong rural demand aiding volume: Rural demand is strong in entry/executive motorcycles, supported by positive sentiments emanating from normal rainfall and government interventions (higher crop prices, rural employment schemes, pay-commission payouts etc) in the run-up to the 2019 general elections and several state elections. HMCL has strong presence across India, with over 6500 touch-points and presence in over 100,000 villages. *Scooters of 125cc displacement are witnessing strong growth and their volume share has increased to 20 per cent of overall 2W industry. HMCL expects to launch new products (Duet/Maestro 125cc) in this segment before the festive season. *To improve presence in premium motorcycles, the company has launched Xtreme 200R at a competitive price in certain markets. *HMCL is working towards expanding its presence in the overseas markets. It has presence in 37 countries. In Bangladesh, it has achieved ~30 per cent share and is the market leader for the past two months. It is working on customisation of products for markets such as Africa. 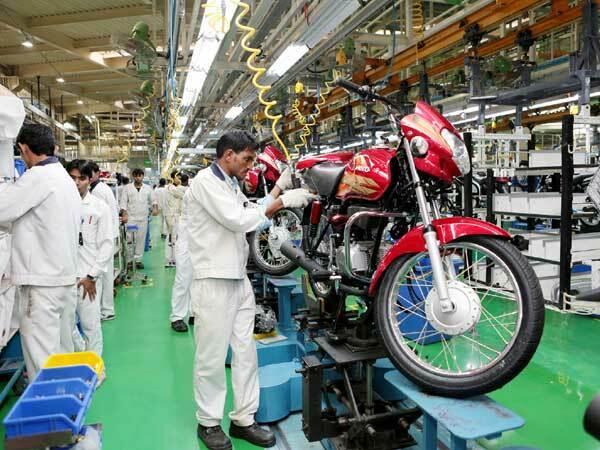 *HMCL had not responded to price competition by Bajaj Auto in 2007 and will not respond this time as well. *Upward trajectory in sales volume to persist in FY19, with double-digit growth in UVs, LCVs and tractors. New products are expected to drive growth in Uvs. Three new products – Mazzoro MPV, S201 SUV and Y400 Luxury UV – are expected to be launched in FY19. *Tractor industry to grow at 12-14 per cent in FY19: Domestic tractor industry growth forecast has increased from 8-10 per cent to 12-14 per cent for FY19. For FY20, growth is expected at 8-10 per cent. Q2FY19 growth is expected to be flat, as festive season has shifted to Q3FY19. *Double-digit growth expected in CVs in FY19. Continuing growth in LCVs and new product launches is expected to support growth going ahead. Eight new products are expected to be launched over the next two years in 5.5-16.2T segments. Expects 10 per cent growth in MHCV industry in FY19, despite change in axle load norms, on account of robust growth in April-July 2018. *Post strong EBITDA margin performance in Q1FY19, the company expects margin to broadly stabilise around these levels. Expect cumulative capex and investments of Rs 10,000 crore and Rs 5000 crore, respectively over FY19-21. *Demand outlook remains strong for aftermarket segment in FY19. Expect double-digit volume growth for 2W/PCR segments in FY19. *PCR growth to be driven by aftermarket segment: In FY19, incremental growth in PCR will largely come from the aftermarket segment due to limited capacity. Once the new plant in Chennai comes on stream, the OEM business is expected to ramp up. *Implementation of new truck axle load norms may lead to near-term weakness in OEM demand and shift towards larger tyres. Most tyre sizes are available, except for few sizes where it may take 6 months for preparing new moulds and commencement of production. *Industry capacity increasing in 2W tyres, which may result in slight increase in competition: MRF has added capacity while the new entrant Maxxis has set up a plant in Sanand with capacity of 0.5-0.6mn tyres/month. *Huge capex planned over the next few years: The company plans to expand capacity by investing Rs 4,000 crore over the next 3-4 years. Net debt stands at Rs 750 crore. Major portion (~70 per cent) of future capex is expected to be funded by debt. *The company expects consolidated revenue of over Rs 7,500 crore in CY18 (over 15 per cent growth), led by volume growth of 12-15 per cent in India business and 5-6 per cent in Europe business. *India volume growth for CY18 is expected at 12-15%, led by growth in underlying segments – private vehicles, tractors, LCVs and two wheelers – and addition of new customers. It has received orders for gears from TBK India, for stampings from Ashok Leyland and for crankshafts from Hyundai. *Europe volume growth in CY18 is expected at 5-6 per cent, which is higher than underlying industry. Meanwhile, Bill Forge revenue is expected to grow at over 20 per cent in CY18, led by new customer additions and increasing production. The Mexico plant is operating at 50 per cent of its peak capacity (4.5mn parts) and is expected to reach full capacity by 2020E. *Capex planned for CY18 stands at Rs 400 crore. *On track to achieve revenue target of US $18bn by FY20: Consolidated revenue to increase from US$9.6bn in FY18 (including Reydel) to US$18bn in FY20, led by a combination of organic and inorganic initiatives. The company is evaluating acquisition opportunities, which would help it to achieve the massive revenue target. *SMP’s new plants – Hungary, Alabama and Germany – would have peak revenue of EUR 1bn. *Focus remains on 40 per cent ROCE by FY20, supported by Ramp-up of utilisation in new plants; improvement in gross margins, led by better sourcing and backward integration; focus on operational efficiencies and reduction in working capital requirements. *Trends such as the proliferation of electric vehicles, vehicle weight reduction programmes and shift in customer preferences towards premium vehicles represent the impending opportunities, as content per vehicle would increase. *The monsoon has been fairly well distributed in key markets – except North Gujarat and few districts in Saurashtra. However, lower opening channel inventory and positive market sentiments have ensured good offtake in Q1FY19 as well as Q2FY19. *GSFC is the market leader in sulphur-based fertilisers, with volume to be ~1.1-1.2mn MT. Management stated that Bentonite Sulphur is doing very well. The new melamine facility is likely to be commissioned by the beginning of H2FY19. This will increase the total capacity by 40,000 MT per annum. Management expects to operate the plant at 80-85 per cent utilisation. Total capex for this plant is ~Rs 800 crore. Steady melamine prices at ~Rs 1,00,000/MT would result in additional revenue of Rs 400 crore at full utilisation, with margins expected at 20 per cent. *For FY19, capro-benzene spread is likely to be ~$ 1,100-1,200/MT. Rupee depreciation will benefit the chemicals segment, as realisations of most chemicals are linked to IPP. *Capex and debt: The capex guidance for FY19E stands at Rs 55 crore, of which Rs 25 crore is regular maintenance capex and Rs 30 crore capex is for key intermediaries. The company plans to be debt free by November this year. As of June, total long-term debt stood at Rs 86 crore. *PAT growth guidance stands at 10 per cent CAGR. Working capital would be 95-100 days. *The company continues to focus on R&D and would continue to strengthen it. It is working with OAT of Japan on a new product. Currently, it is in the data generation stage and would take at least three years to launch this in the domestic market. *On the collaboration side, the company is working closely with Nissan Chemicals and is expected to launch one new product this year and three new products by next year. Notwithstanding the recovery in system credit growth, corporate credit demand is still slack. Retail and SME segments still remain favourable with some pick-up seen in mortgages and vehicle loans. Few large private banks are witnessing a surge in personal unsecured credit. The BFSI (Banking, financial services and insurance) sector is witnessing margin compression due to rising interest rates, as cost re-pricing precedes lending rate adjustments; lenders with superior liability franchise are likely to maintain stable NIMs Q3FY19 onwards. Asset quality worries for banks remain; few banks are guiding for normalisation while most are still indicating continued pain going ahead. For NBFCs, the overhang of IND-AS transition is behind and they continue to gain market share. Loans and deposits should continue to grow at a similar pace and the bank targets 15 per cent growth for FY19. Retail and SME growth for the bank continues to remain robust. Corporate growth should be conservative, with the bank’s increased focus on better-rated corporates. The loan mix should continue to shift towards retail/ SME, forming two-thirds of total advances. *Retail lending for the bank primarily includes home loans, which is growing at a modest ~11 per cent rate year-on-year. The bank is also witnessing better traction in other retail lending products, such as credit cards, personal loans and educational loans. *On the liability side, the bank will continue to focus on CASA growth, particularly on savings account growth. On the asset quality front, slippages should continue to remain elevated for one more quarter, and could come predominantly from the BB-and-below pool. *The downgrade cycle is largely over and BB below pool will not witness any significant rise going forward. The bank has a total write-off asset pool of Rs 14,000 crore to Rs 15,000 crore and recoveries in this pool should improve its profitability. *On power sector exposure, there is not much stress in the standard book as a large chunk of the loans are in renewables. There is only one lumpy account in the BB-and-below pool during Q1FY19. *The bank has started focusing on the retail book where it has lowest market share of ~3.3 per cent and is growing at a robust pace, with increasing contribution from new-to-bank (NTB) customers. The contribution in retail loans sanctioned from the NTB has increased from 8 per cent in June 2016 to 14 per cent in June 2018. The bank will continue to grow in high double-digits, with higher traction in auto, personal loans, etc. In auto loans, the bank is focusing on tractor loans, fleet financing and passenger loans, car loans, etc. *The total outstanding watch list is about Rs 8,600 crore which includes all S4A accounts as well as accounts under SMA I/II also included. Incremental slippages are expected from the watch list with overall slippage trend heading southwards. The bank formed a separate team for the collection of loans, which is specialised in this area. *The bank is adequately provided on the power exposures and does not see any stress in the standard exposure as a large part of the standard power loans are to renewables. *Management believes that retail penetration is still low and will continue to remain robust over the next few years. HDFC Bank is the largest credit card provider in the country, with nearly ~10-11mn credit cards. It still sees significant opportunities for growth as currently the total number of credit cards issued are only 32-33mn. *Approximately 70 per cent of HDFC Bank’s credit card holders are its customers, so are about 50 per cent of the personal loan borrowers. The bank currently has an overall customer base of ~45mn. *If 10 per cent of India’s population becomes eligible for credit cards in the next few years, HDFC Bank is well-positioned to capture that growth, with its strong presence and digital initiatives. *The wholesale book has started recovering and demand is mainly for working capital loans. The bank is witnessing relatively stiff competition especially from PSU Banks under Prompt Corrective Action (PCA) for its targeted corporate customers. *The Agriculture loan portfolio continues to remain unstable, witnessing higher delinquencies for a while. However, in the SME segment, management does not see any risk and believes that growth is fairly modest. *HDFC did not experience any resistance from customers or price competition from other lenders when it raised lending rates in line with the rise in cost of funds driven by RBI’s rate hikes. As a result, the company was able to sustain spreads in Q1FY19. In addition, with the rate differential between AAA, AA and A-rated instruments widens as rates rise, the lower-rated banks and NBFCs are witnessing steeper rises in their cost of funds and MCLR rates compared with AAA-rated corporates, such as HDFC. *For HDFC, the LGD for retail stood at ~8 per cent as of June 30, 2018 while for corporates it stands at 20-21 per cent. The higher LGD for corporates is priced into higher yields. *As of end-March 2017, HDFC had Rs 5,000 crore in excess provisions, which would have to be written back on the adoption of IND AS, resulting in an artificial net worth increase and leaving no buffer for provisions during bad times. *The implementation of GST on the sale of under-construction flats has affected demand from high-end buyers rather than mass market buyers. The high-end buyers are now buying only after project completion when GST is no longer applicable. *HUDCO’s management expects industry credit growth to pick up from here on, with the low- to mid corporate sector leading the charge. Eleven banks being under PCA, few players remain in the market who are willing to lend for longer tenures. This creates a niche for HUDCO, given its ability to lend for longer tenures and substantial capital available to do so. *Disbursements for FY18 (~Rs 16,000 crore) surged because of heightened development activity in Uttar Pradesh. From a steady state perspective, disbursements are expected to sustain an average run rate of Rs 10,000 cr to Rs 12,000 cr. *HUDCO has been lending only to government agencies over the last five years. *About Rs 3,500 crore of the loan book is legacy loans to the private sector, of which ~80 per cent (~Rs 2,700 crore) is already provided for. HUDCO expects resolutions under NCLT to result in recoveries as these are not junk assets. Recoveries should help boost NIMs. *Better product mix (with focus towards Protection), improving persistency and digital initiatives will be the main divers to improve value of new business (VNB) margins. *It is targeting 25 per cent growth in new business premium (NBP) in FY19. Further, over the next two years, it targets to improve VNB margin (on effective tax basis) by 200bps. Return on embedded value is expected to be stable ~20%. SBIL targets to improve its 13th month persistency to 85-86 per cent in FY19 from ~83 per cent currently. *SBIL launched two new products, that is Poorna Surakhsa and Cancer Care, in Q4FY18, which have now started to see good traction. Credit life single premium product launched in March’18 is doing exceptionally well. * It targets broadly similar product mix as seen in Q1FY19 with protection contribution at 10 per cent of NBP (5 per cent on APE basis). Given that it has launched single premium credit life product (replacing earlier regular premium product) in March’18, numbers on APE basis will not reflect the true picture.